This past weekend was a “free” weekend where there were no classes or trips scheduled through the program so we were able to travel outside of Delhi on our own if we wanted. Some of us in my program decided that this would be a great weekend to travel to Jaipur. 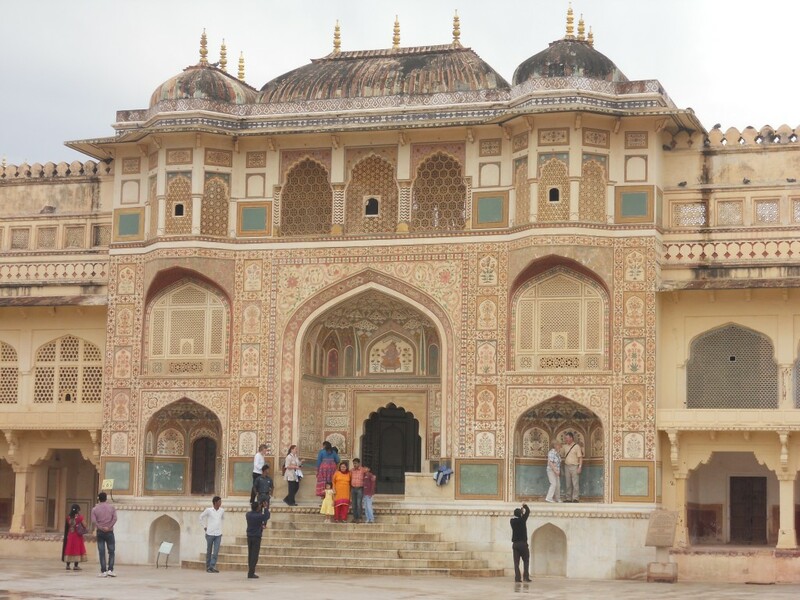 Jaipur is a great city located in the ‘golden triangle’ of India. It has a lot of temples, palaces, and other great things to discover. It was impossible to see everything in two short days but we made the best of it. Saturday we visited the Amber fort which is on top of a mountain and gives a great view of the city and valley below. 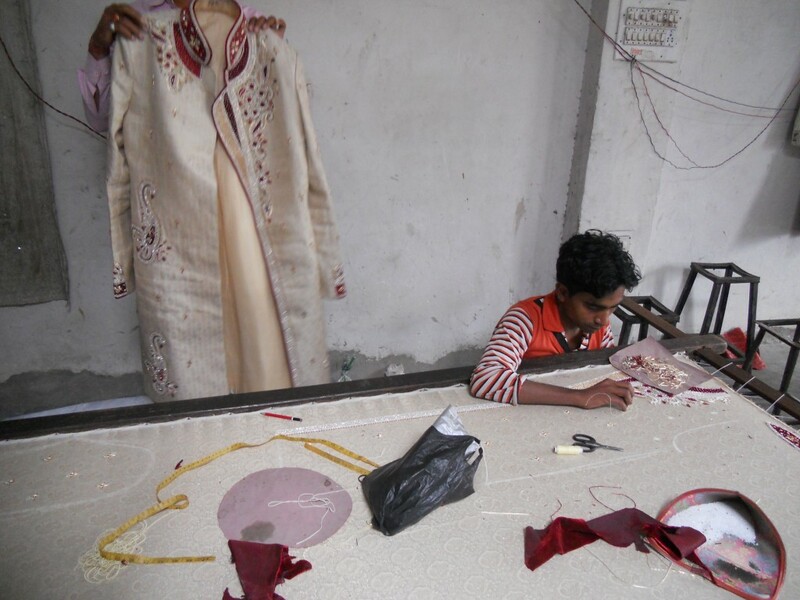 Then we did some shopping where we were able to see how textile fabrics are made and watch someone sew beads onto an Indian wedding outfit. 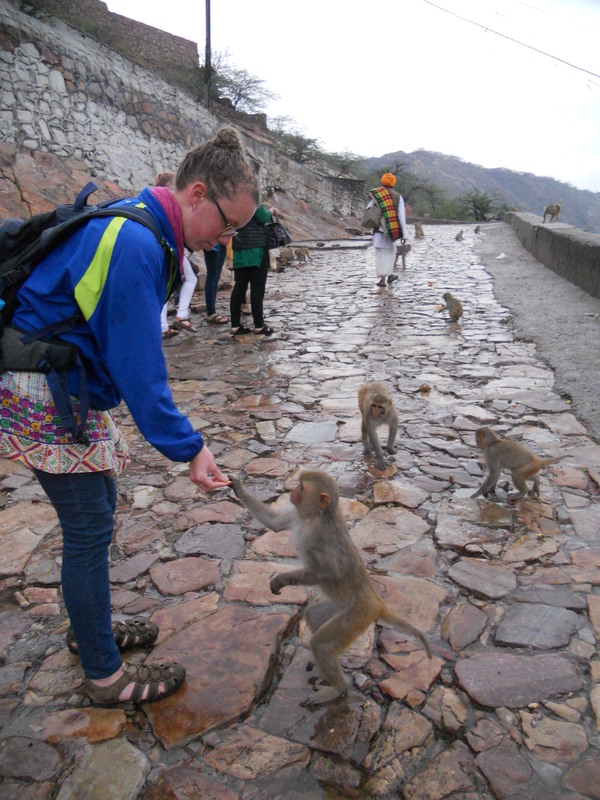 Then we visited the monkey temple where we were able to get really close (sometimes too close) to monkeys and feed them. Just a small part of the Amber Fort. On Sunday the group split up. Some people went shopping but I along with others decided that we wanted to try and find the city palace. We got some directions from a rickshaw driver and headed out. It didn’t take long to realize that we had no idea where we were going. We asked people in our broken Hindi for clearer directions. Everyone we asked pointed in different directions and said 1 kilometer. This is where we learned that in India everything is only 1 kilometer away even if it is actually multiple kilometers away. While wandering around we came across a field where there were a bunch of kids playing cricket. There were at least 30-40 games being played! It is currently the cricket world cup so cricket is everywhere! 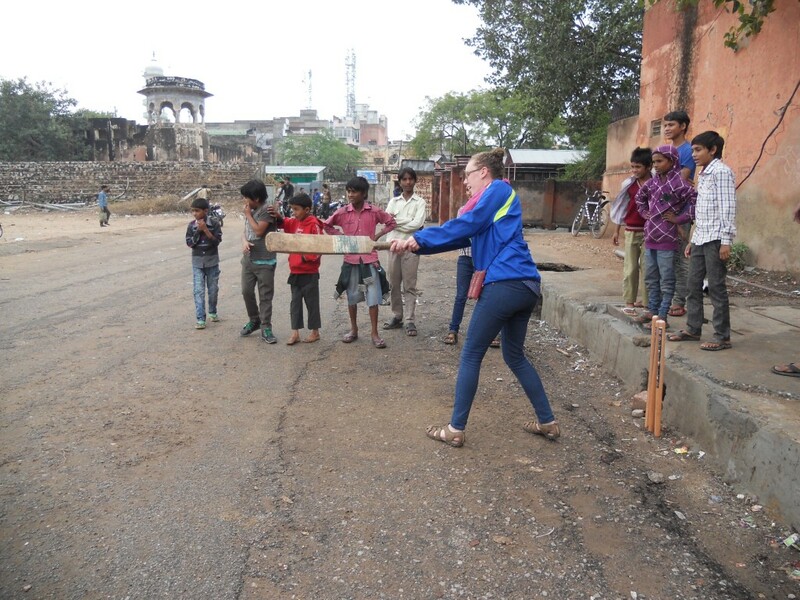 I have always wanted to play cricket so I asked some of the kids if I could join and I hit a few times. I like to think I was pretty good at it (thank you high school softball!). We kept walking around the neighborhood and saw a beautiful archway that looked like it led to a park. We walked in to look around. Half of the park was a green space with grass and benches. The other half was all playground toys. Have you ever wondered what happened to the toys that were on your elementary school playground as a child but are now considered unsafe? They are probably in this park in India. It was fun to walk through and relive those childhood memories. 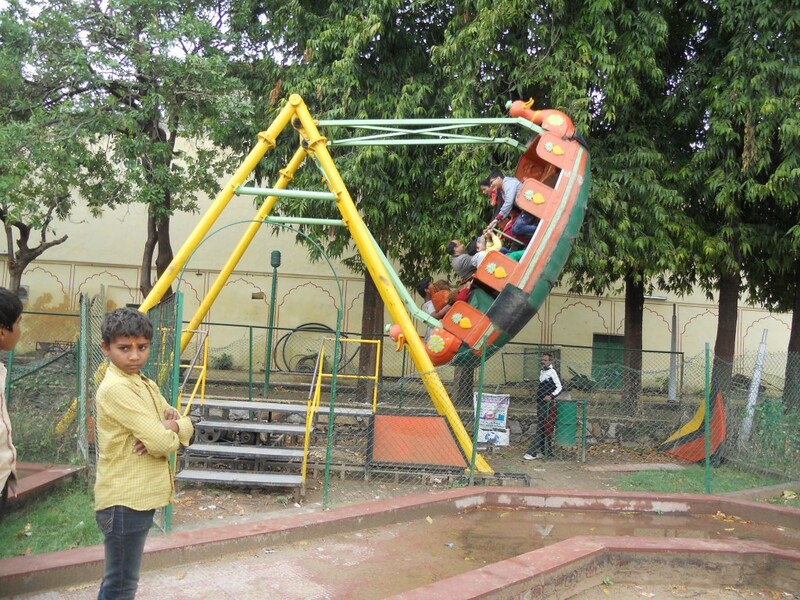 This park also had carnival rides for 10 Rupees. I rode on the boat ride. This is probably the most unsafe situation I have put myself in yet. There was nothing to hold us in, just a bar with loose screws that we could hold onto. The ride went so high that you actually lifted off of the seat. This is easily the hardest I have laughed in a long time. We did eventually end up finding the city palace but we did not have enough time to go through it before we had to go to the train. 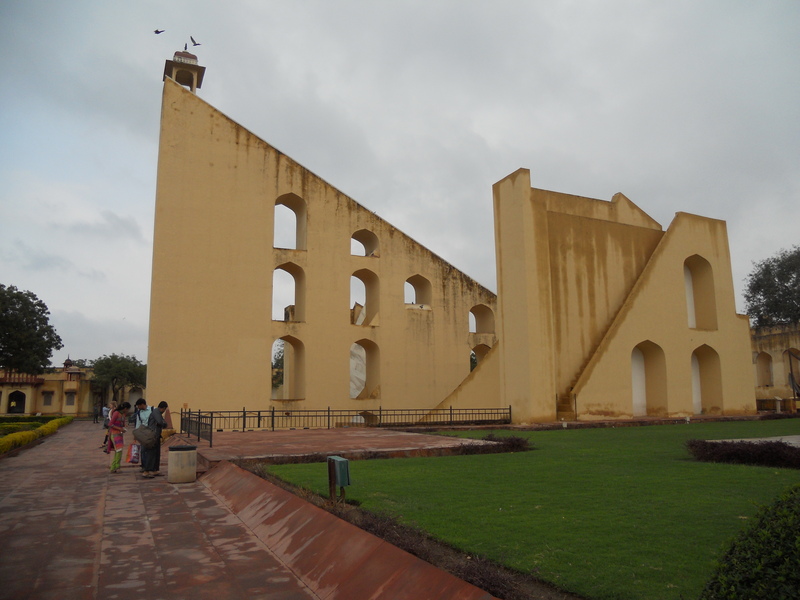 Instead we opted to go through Jantar Mantar which is a garden with different structures that have to do with astrology and weather. The structures are all very unique and it kind of felt like walking through Alice in Wonderland.